i recently bought a circlar-polariser and mounted it on the 18-55. for the next few days i forgot that there was a polariser attached to the lens and never remembered to use it while shooting. but last week i kept reminding myself to swivel the polariser before clicking. then one evening, i kept turning the filter trying to capture the ambient lighting of prithvi cafe. but to my frustration all the shots were turning out rather dark. i was in a hurry to leave and couldn't give it much thought then. later that night i realised that its counter-productive to use a polariser in low light conditions. 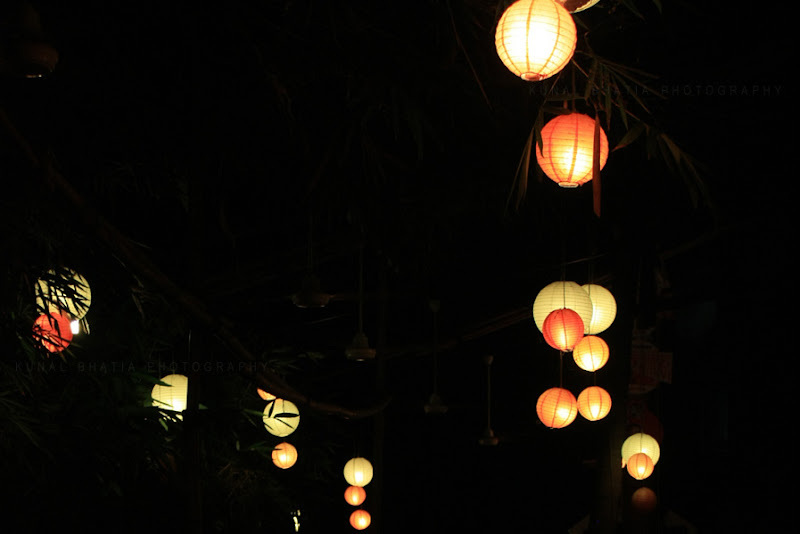 after cropping the portrait shot to a landscape-format, these chinese lanterns hanging in the cafe make for a decent shot. just shows how far i have to go with my photography. for a quick run through about polarising filters for digital cameras, go to DPS here.